It was a Monday night matchup of Florida teams on October 12, 1998 as the Jacksonville Jaguars hosted the Miami Dolphins. The Jaguars, coming off of their bye week, were undefeated at 4-0 while the Dolphins, having lost the previous week, were 3-1. The Jaguars, in their fourth season and coached by Tom Coughlin, were a potent offensive club. 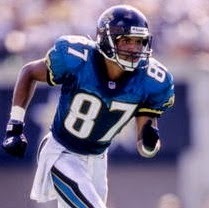 QB Mark Brunell had good targets in wide receivers Jimmy Smith and Keenan McCardell and the addition of rookie RB Fred Taylor (pictured at right) made the attack that much stronger. The defense was more of a concern, especially the pass rush, which it was hoped would benefit from the return of DE Tony Brackens, who was making his first appearance after being out with an ankle injury. The Dolphins, under Head Coach Jimmy Johnson, still relied on 37-year-old veteran Dan Marino, as they had since he took over the starting job in 1983. While chafing in a more conservative offense, he was still a potent passer. The ground game, led by RB Karim Abdul-Jabbar, remained undistinguished, but the defense was tough up front and benefited from the presence of MLB Zach Thomas. There was a crowd of 74,051 in attendance at Alltel Stadium, the largest to date in the franchise’s brief history. Things started off quickly for the Jaguars when Fred Taylor, taking advantage of a big hole off tackle, broke away to the outside for a 77-yard touchdown run. Mike Hollis added the extra point for the early 7-0 lead. However, while Jacksonville’s next play consisted of Mark Brunell throwing to Jimmy Smith for 41 yards, the game settled into a punting exchange for the remainder of the first quarter. Taking over at their own 47 in the last two minutes of the opening period, the Jaguars began to move effectively. Brunell completed passes to WR Reggie Barlow for 20 yards and FB Daimon Shelton for 19 to advance to the Miami eight as the quarter wound down. On the first play of the second quarter, Brunell threw to RB Tavian Banks for six yards and Taylor followed up with a two-yard TD carry. Hollis again converted and Jacksonville held a 14-0 advantage. Miami responded by driving 69 yards in 12 plays. On a second-and-13 play, Dan Marino (pictured below) connected with WR Oronde Gadsden for 23 yards to the Jacksonville 38 and, after he was sacked by LB Bryce Paup for a loss of six yards, Marino completed a pass to WR Lamar Thomas for another 26 yards. A throw for seven yards to FB Stanley Pritchett set up three straight carries by Karim Abdul-Jabbar. Marino tossed a two-yard TD pass to TE Troy Drayton, Olindo Mare added the PAT, and Jacksonville’s edge was cut to 14-7. The Dolphins got a break when CB Terrell Buckley intercepted a Brunell pass to give Miami the ball at the Jacksonville 36, but after advancing ten yards Marino was picked off by CB Aaron Beasley to end the threat. As time ran down in the first half, the teams again exchanged punts, but with 21 seconds remaining on the clock Banks ran up the middle for 51 yards to the Miami 31. However, Hollis was unsuccessful on a 45-yard field goal try as time expired and it remained a seven-point contest at halftime. In a penalty-filled series to start the third quarter, the Dolphins took advantage of a pass interference penalty on a third-and-22 play to move to the Jacksonville one, from where Abdul-Jabbar scored and, with Mare adding the extra point, the score was tied at 14-14. The Jaguars went three-and-out and punted, and Miami drove to another touchdown, moving 63 yards in nine plays. Marino completed all five of his passes, the longest to Thomas for 21 yards and the last to Drayton for the 15-yard TD. Adding on Mare’s point after, the visitors held the lead at 21-14. The teams again traded punts as the game moved into the fourth quarter. However, the Dolphins were trapped deep in their own territory prior to kicking and the punt by Mare (who was subbing for Klaus Wilmsmeyer) traveled 36 yards, giving Jacksonville good field position at the Miami 40. After a first down incompletion, Brunell made good on his next three passes, two of them to Keenan McCardell that included a 23-yard touchdown. Hollis added the game-tying extra point. Following another exchange of punts, the Dolphins put together a promising drive. Uncharacteristically keeping the ball on the ground for the most part, Abdul-Jabbar ran four straight times for 24 yards to the Jacksonville 41 and, after a short Marion pass completion, RB John Avery gained three yards. But Marino’s third down pass fell incomplete and, with Coach Johnson taking a gamble on a long field goal, Mare’s attempt from 54 yards was unsuccessful. It didn’t take long for the Jaguars to respond. Brunell passed to McCardell on first down, and it went for 56 yards and a touchdown. Hollis converted and the home team was up by seven with 2:36 left in regulation. Marino came out throwing, connecting with Gadsden for 28 yards, but two plays later he fumbled while being sacked and Tony Brackens recovered for Jacksonville. Three running plays and a punt left Marino and the Dolphins just 49 seconds to work with, and the game ended for them at their 34. The Jaguars came away winners by a final score of 28-21. Jacksonville had a slight edge in total yards (385 to 374) while the Dolphins had far more first downs (25 to 12). The Jaguars were better balanced, rushing for 186 yards and passing for 199 while Miami gained just 67 yards on 28 running plays and had 307 net passing yards. The Dolphins turned the ball over twice, to one suffered by Jacksonville, and were also the more heavily penalized, getting flagged 11 times at a cost of 89 yards to eight penalties on the Jaguars for 86 yards. Mark Brunell completed 12 of 18 passes for 213 yards and two touchdowns while giving up one interception. Fred Taylor, who got the game off to a rousing start but left in the third quarter with a bruised shoulder, rushed for 89 yards on 12 carries that included two TDs and Tavian Banks, who had a long carry of his own, contributed 75 yards on nine attempts. Keenan McCardell (pictured at left) was Jacksonville’s receiving star with three catches for 86 yards and two scores. Reggie Barlow had four receptions, for 50 yards, and Jimmy Smith had one for 41 yards but missed the second half due to a hamstring strain. For the Dolphins, Dan Marino was successful on 30 of 49 throws for 323 yards and two TDs with one interception. O.J. McDuffie had 7 catches for 68 yards while Troy Drayton made 6 receptions for 30 yards and two touchdowns. Oronde Gadsden gained 91 yards on his five catches to top the club. Karim Abdul-Jabbar rushed for 43 yards on 23 carries that included a TD. Having reached 5-0, the Jaguars lost their next two games on the way to an 11-5 record that topped the AFC Central. They defeated the Patriots in the Wild Card round before losing to the Jets in the Divisional playoff. Miami rebounded to win two straight and finished second in the AFC East at 10-6. Qualifying for the postseason as a Wild Card entry, the Dolphins also won in the first round before falling to Denver at the Divisional level. Mark Brunell missed three games due to injury but still passed for 2601 yards and 20 TDs with a solid 89.9 rating. 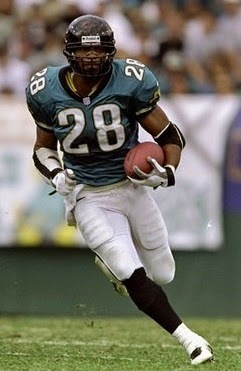 Fred Taylor rushed for 1223 yards on 264 carries (4.6 avg.) and caught 44 passes for another 421 yards, compiling a total of 17 touchdowns. It marked the beginning of a very good 13-season career. Keenan McCardell had 64 catches for 892 yards (13.9 avg.) and scored six TDs. Dan Marino threw for 3497 yards, his 13th year with 3000 or more, and 23 touchdowns in what was his next-to-last season. O.J. McDuffie remained his top target and led the NFL in pass receptions with 90, gaining 1050 yards and scoring seven TDs.